Ontario Northland purchased a WTL8200 portable wheel lathe from your company in June of 2015. Since this purchase we have profiled approximately 30 pairs of locomotive wheels. This machine has proven invaluable to our Cochrane Locomotive Shop operation. The machine has produced consistent excellent results and reduced our locomotive out of service time dramatically. Training in machine use and set up provided by Delta Manufacturing was excellent. Any service and assistance required from Delta Manufacturing has been timely and helpful. We are presenting our recommendation for the 4th Generation WTL8200 Portable CNC Locomotive Wheel Lathe we bought last year. During the time we have worked with the wheel lathe we have found its features very convenient, for example, the fact that there is no need to grease the lathe manually, no need to replace belts, no need to have a wide space to work with. This is an advantage for us because of the conditions it is been used in. Presently working in Arriaga Chiapas in Mexico. Also, we can recommend the machine for both its material quality and design as well as for it functionality. We recommend this equipment because it is practical and efficient. Just as a piece of information, so far during the course of 6 months, we have turned already 48 wheelsets. I have been involved in the locomotive repair business for the past 39 years, and feel like I know when I see a huge improvement in the way wheels are maintained. I had the opportunity to see an in the field demonstration of the Delta manufacturing Wheel Hog. I was impressed to say the least. I was impressed enough that our company purchased one of the Wheel Hog lathes. The Wheel Hog takes all the guess work out of the shaping of the flanges and truing of the wheels. It cuts a perfect flange every time. It also moves the operator away from the shavings, making it much safer. Cutting wheels is not the dreaded job it once was and the quality of the job is perfection. SAFETY, this is the most important aspect, it keeps the operator at a safe distance away from the rotating wheel and the hot razor sharp metal being removed. ACCURACY, the computer removes the possibility of operator error once the correct setup is performed, correct profile is always maintained. EFFICIENCY, because the computer cuts both X and Y axis each time, it eliminates the need to continually measure the wheel to check measurements and profile. PORTABILITY, this machine can be used at various locations. It can be used on a flat surface, over a pit, or addapted to a stationary jig like what I built at the NECR. Delta Manufacturing is in the design/build stages of a stationary wheel truing machine which would be better suited for the large shops with a drop table and overhead crane. It would have the ability to drive the wheels without the traction motor attached so both locomotive and car wheels could be cut. They are also developing a computer with two screens that would operate two lathes simultaneously. 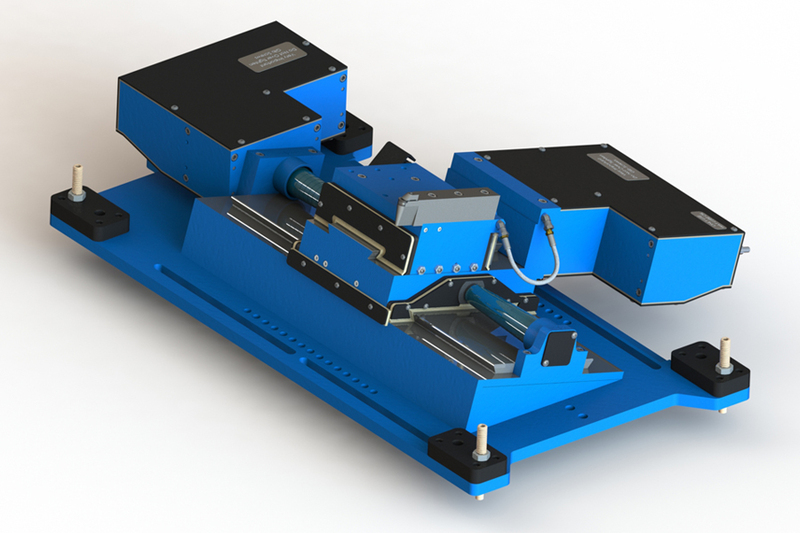 This would allow one operator to cut both wheels in a stationary jig and reduce cutting time. In summary, I feel this company is very innovative and has the talent and ability to provide us with tools that will meet our needs system wide.